In a sign that crude oil train shipments to California refineries are on the rise, Union Pacific railroad officials confirmed last week they are now transporting full trains of Canadian oil through Northern California on a route that likely cuts through central Sacramento. State rail-safety inspectors shadowed the initial trains outside of Bakersfield and reported the mile-long trains were traveling at slow speeds, most likely out of caution, just days after a UP corn train derailed in the Feather River Canyon and spilled feed into the river. The Canadian imports are the second set of all-oil trains now believed to be coming through the capital on a regular basis. A Bakken oil train comes through midtown Sacramento once or twice a week en route to Richmond in the Bay Area. Several more oil trains may join them in the next year. Valero Refining Co. has applied for permission to run two 50-car oil trains a day through Sacramento to its plant in Benicia, and Phillips 66 has plans to run oil trains five days a week into its refinery in San Luis Obispo County, some from the north and some via southern routes. Because fossil fuels are a finite resource, petroleum companies are now resorting to more extreme forms of oil extraction, including tar sands, fracking, and Arctic exploration. The tar sands are deposits of heavy crude oil trapped in sand and clay that are extracted using enormous amounts of water, as well as open pit mining, heat and horizontal wells. The largest deposit of Canada’s tar sands is along the Athabasca River in Alberta (Source: http://albertacanada.com). Why is everyone so worried about the tar sands? First, tar sands oil extraction and production emit three times more carbon dioxide than the extraction and production of conventional oil. Second, tar sands extraction requires total destruction of pristine areas within the Canadian Boreal forest, one of the few large, intact ecosystems on Earth (Source: Friends of the Earth). Finally, the extraction of tar sands will have devastating global impacts. In a 2012 editorial in the New York Times, Jim Hansen of NASA famously wrote that if the tar sands are fully excavated, it will be “game over for the climate,” because Canada’s tar sands contain twice as much carbon dioxide (CO2) as has been emitted over the entire span of human history (Source: NYT! 5/9/12). What does this have to do with Martinez? 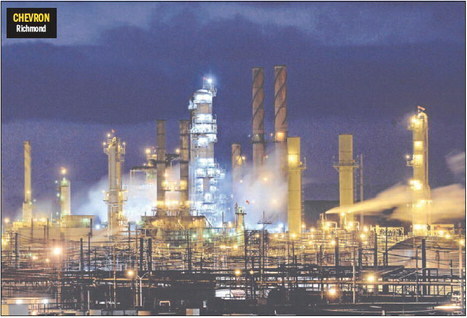 Shell Refinery in Martinez is currently receiving and processing tar sands (Source: CC Times, 6/1/13). Contra Costa County’s air is already very polluted, and this type of refining will only make it worse. Shell’s choice to refine tar sands will worsen the health of Martinez residents; pollution emanating from tar sands refineries are directly linked to asthma, emphysema and birth defects. (Source: Sierra Club, Toxic Tar Sands: Profiles from the Front Lines). Additionally, the U.S. Geological Survey found that tar sands bitumen contains “eleven times more sulfur and nickel, six times more nitrogen, and five times more lead than conventional oil.” (Source: Environmental Integrity Project, Tar Sands: Feeding U.S. Refinery Expansions with Dirty Fuel). But wait, there’s more … Shell also has a global role in profiting from the destruction of the climate. Royal Dutch Shell owns a whopping 60 PERCENT of the Athabasca Oil Sands in Alberta, Canada (Source: www.shell.com). If you Google “Athabasca tar sands,” you will see a veritable “Mordor” on Earth. If all this makes you feel completely overwhelmed, get connected locally and join the Martinez Environmental Group. Climate change issues are happening literally in our back yard and we CAN do something about it. If you want to stay updated on these issues and learn how to get involved, please go to http://mrtenvgrp.com/category/meetings.